I am excited to let you know that we are now accepting new patients for our Intensive Outpatient Programs at Doorways! 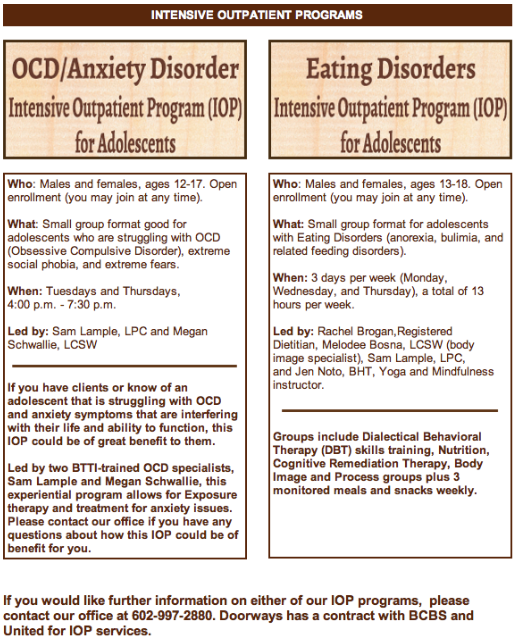 These programs are highly successful as they offer an intensive, therapeutic approach to meet the individual’s needs. We are also contracted with Blue Cross Blue Shield and United Behavioral Healthcare for our IOP’s. If you know anyone who may benefit from one of our specialty IOP programs listed below or would like to register, please give us a call at (602) 997-2880. We would love to help!